As I am fast approaching week 39 of my pregnancy, we are now awaiting the arrival of our baby any moment. I have been enjoying my gentle bike rides and I’m certainly making the most of them before the little ‘un arrives and I’ll be parking up my bike for a little bit; cycling and my bike have never let me down. I continued to feel independent and able to embrace the belief and perception of a pregnant body as strong and wondrous, much contrary to those people who still see the pregnant body as ‘incapacitated’ (!!). Cycling has been one of my highlights of this pregnancy. It has felt like a trusty companion in this adventure, never leaving my side. Through the first trimester’s nausea, the second trimester’s energy and feeling of wellbeing all the way through the third trimester where the bump weight and overall tiredness have made walking not as fun as it normally is. It has kept me healthy (I didn’t suffer from one single cold or ailment nor I did take one single paracetamol in 9 months), strong, active and mobile. And yes, I have felt happy. It has connected me to my baby more than walking or driving ever could (I actually disliked driving while pregnant and glad I had to do it only on rare occasions). *And* I am quietly confident I have given my baby a great cycling start already. All my medical care team (I have a history of kidney disease, discussed here on the blog in the past, which although it is now mostly resolved it has required extra vigilance while pregnant) have all been impressed by my overall positive and healthy pregnancy. I am not saying I’ll be cycling to my hospital in labour but I hope to be cycling for next few days till right up to it. In the meantime cycling dates with my husband continue to be aplenty. 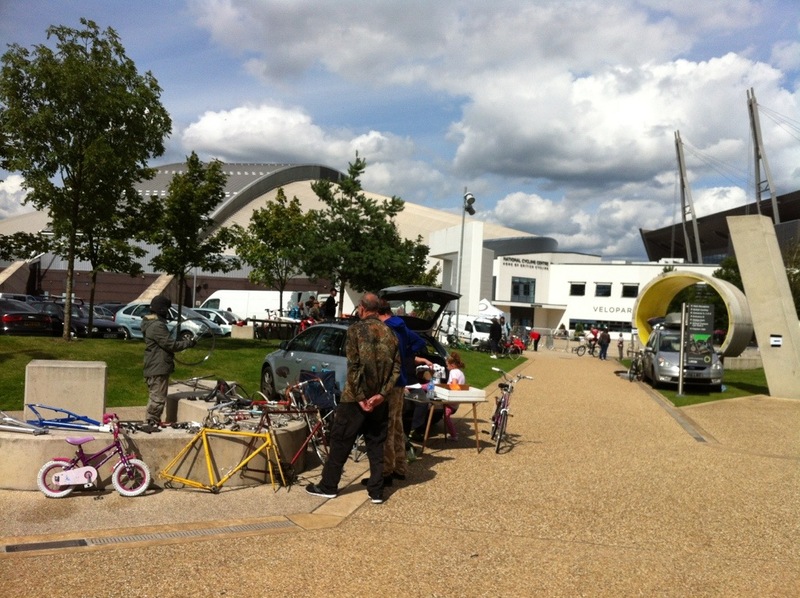 On Sunday we headed to the National Cycling Centre to have a look at the bike jumble sale (where I saw my dream mixte and thank goodness my heavily pregnant bump stopped me from buying it!) and enjoyed a simple yet delightful picnic overlooking the Ashton Canal. 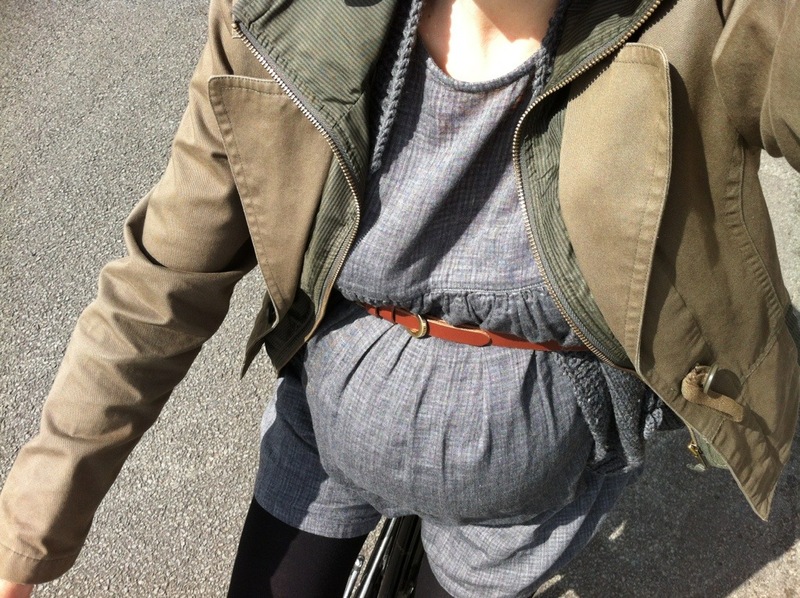 I hope that the few blog posts in which I have shared my experience of cycling while pregnant in Manchester may give confidence to other women to not give up their beloved bikes during their pregnancy, it is a brilliant 2wheels adventure! So how long before the baby seat is installed on the bike then?! I think I’ve already found the child seat of choice, which I think will be an apt Christmas present 😉 then as soon as baby will be ok and safe to get on the seat we’ll be out and about on new cycling adventures! Wow – soon be here LC! this is such a great post, full of joy. glad your kidney hasn’t been affected. all my love! M.